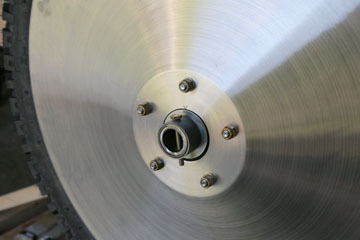 The inner cover is captured between the brake drum and wheel and is attached to the hub with bolts and nuts. 3/16" spacers were made to trap the cover snugly between the hub and brake drum. But this won't work for the outside covers because there is no access to the interior of the wheel. Consequently, the attachment needs to be on the exterior of the outside cover. Here are 1/4" x 1/2" machine thread bolts that I used to make studs for the outer cover AN4 lug nuts. The bolts were MIG'd to the outer face of the hub, carefully centering them over the holes in the hub that matched the holes I drilled in the covers. Here are the bolts welded to the hub, I will clean it and touch up the paint later. 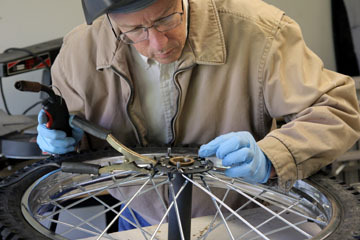 The thickness of the bolt heads is just right for spacing the covers above the spoke heads. 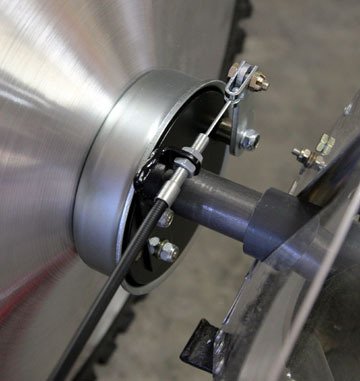 The result is a very clean installation that allows the cover to be quickly removed for airing the tire. Or, I may cut a small hole in the inner cover for access to the valve stem. 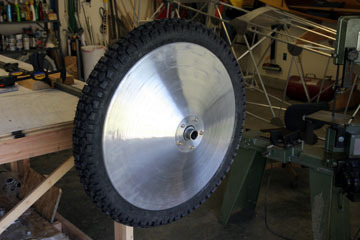 I'm considering a "hubcap" that will be captured by the nuts and cover the end of the axle for a really finished look. Instead of having a torque arm for each brake I decided to anchor each backing plate to the axle and then have one arm for the entire axle. That arm will be inside a gear leg and less visible. Here is the attachment bracket made from 1.375 x 0.058" 4130 tubing and 0.090" 4130 sheet. I usually gas weld 4130 but used MIG because it was quicker and fine for this application. 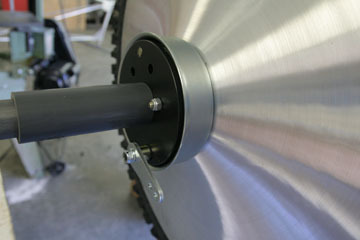 The sleeve slides over the axle and is attached to the axle with an AN4 bolt that also secures the inner axle sleeve. Another 1/4" bolt attached the backing plate to the bracket and anchors the brake. Another view of the anchor bracket. 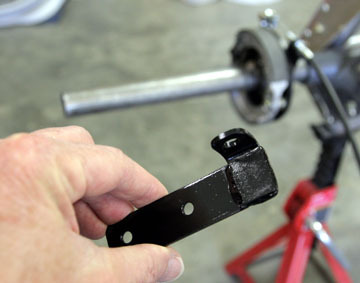 Carefully locating the holes makes it possible to assemble the whole setup without removing the brake shoes. 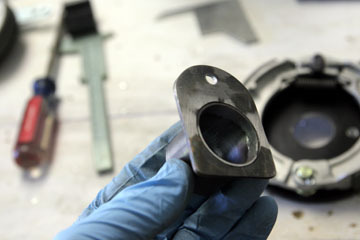 After the bracket and backing plate is in place, a machine shim goes over the axle to serve as a thrust bearing between the bracket and bronze bushing in the wheel. I found these shims in the odd-n-ends drawers in the hardware section of the local Lowes. They fit perfectly. Here is the finished installation with the schedule 80 PVC wear bushing against the backing plate. 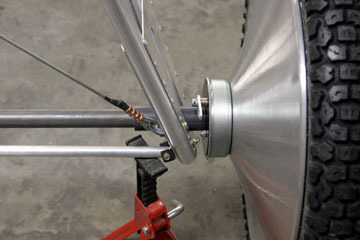 Last step is the wheel keeper made from 1.375 x 0.058" 4130 tubing and secured with an AN3 bolt. Another thrust washer is between the keeper and bronze bushing. End of a full afternoon and evening--the Fokker with its new wheels. There is still much to be done to finalize brakes and shocks but the foundations are now in place. 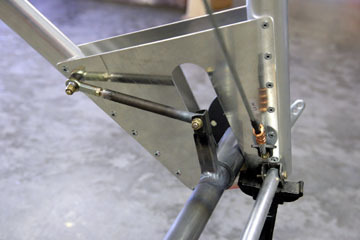 One task is to weld a mount to the axle for the brake torque arm. 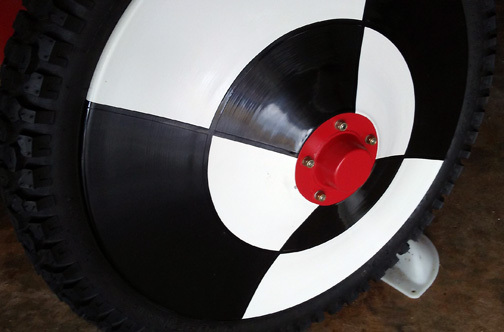 The wheel cover disks are really cool but leave the end of the axle along with the retaining collar and hardware exposed to the elements and critical eyes. I decided to put those homely axles under cover where they belong. Because there are no 'factory' hubcaps available, it was necessary to resort to shade-tree engineering to design and fabricate hubcaps. retreated to the Fokker factory. 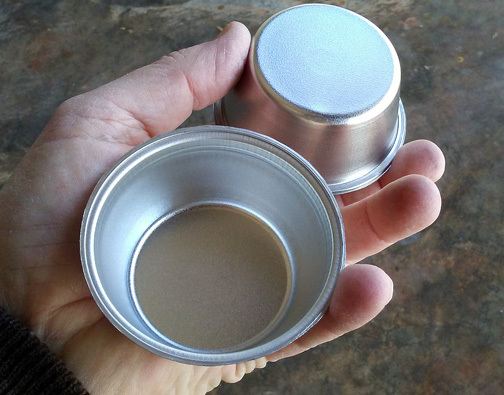 Two cups were cut from the tray and carefully trimmed to final size. 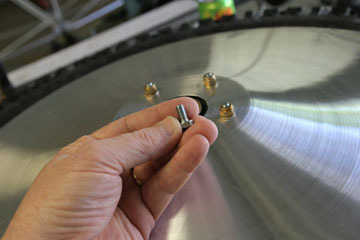 A trim ring was cut from 0.032" 6061 and drilled to fit the wheel cover mounting bolts. 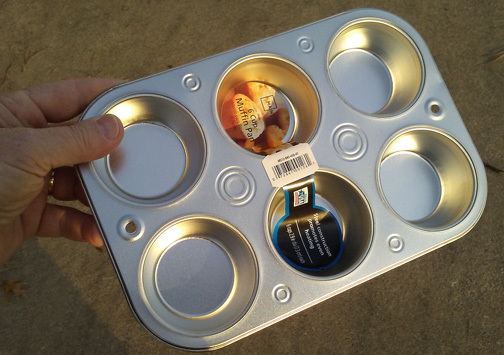 This was attached to the muffin cups with proseal tank sealant. JB Weld would have also worked fine. 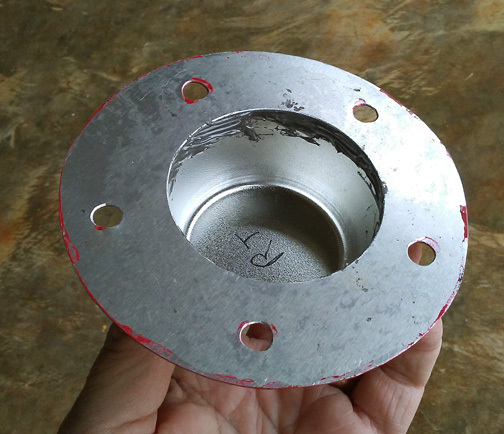 Here is a finished hubcap attached to the wheel cover via the mounting bolts. Nice! 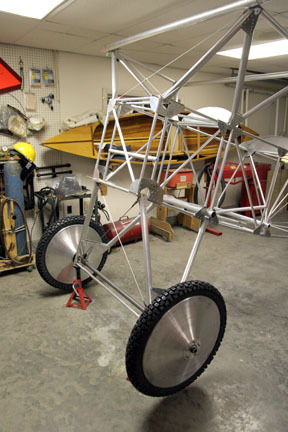 While reflecting on the mocked up wheels and brakes, it became apparent that the drums had stolen axle real estate that was originally intended for the bungees. 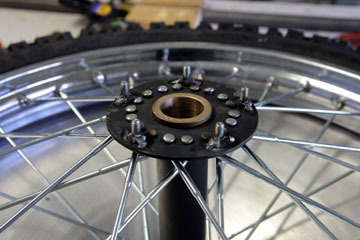 The axle supplied with my kit was already cut to length per the plans which do not allow for drum brakes. This obviously required resolution. 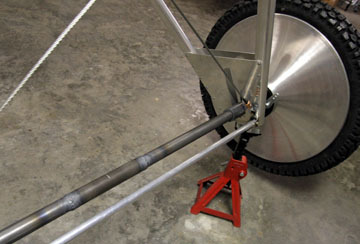 The solution was to lengthen the axle by three inches. Since I never throw away tubing cutoffs, I had available some 1.125" and 1.375" 4130 which was perfect for splicing the axle inside and out. 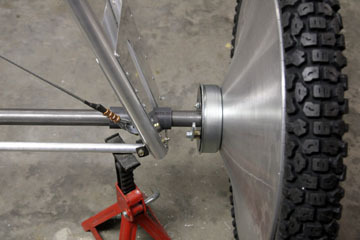 The axle was cut at mid-span, the 1.125" tubing inserted into the 3" gap and welded in place, and the 1.375" tubing covered the splice and was gas welded to finish the new axle. Now axle space for the bungees has been restored, and we picked up three inches of track which should be a good thing. I don't think adding 1.5" of moment to the end of the axle will create any issues because of the heavy steel insert inside the outboard ends of the axle. While bungees were under consideration, I added some caps to the end of the gear legs to prevent them from damaging the bungees. Fabricated and welded the brake torque arm to the axle. The arm is 1" x 1" square 4130 and the rod is 1/2" 4130 with a bushing on one end and a rod end bearing on the other. 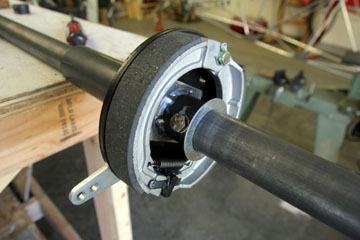 The bushing is slightly over-size to allow some lateral movement of the rod as the axle moves inside the gear. 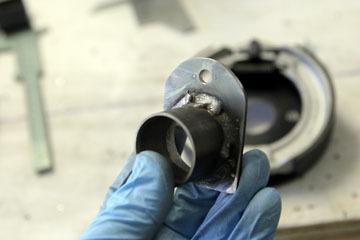 The bearing was necessary because of the compound angles involved. 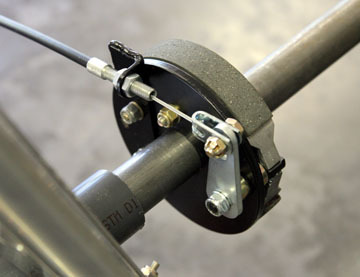 The bracket for the brake cable attaches to the backing plate with two 1/4" bolts. 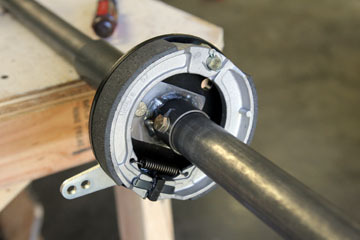 I decided to put the adjuster on the wheel end of the cable for easy access. The cable kit is available from Tracy O'Brien. Here is the bracket I welded up from mild steel strap stock. Another view of the cable attachment. Strong and simple. 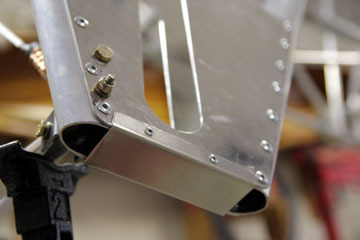 The brake arm is machined so it can be easily clocked to whatever position is needed.